We stayed at the Four Seasons Bora Bora for 6 days. The hotel picks you up at the airport with a Riva-style motor boat, wood and blue. The hotel is amazing, built in 2008 I think it is the newest property on the island. It's located in Motu and occupies all of the beaches on the lagoon side and mountain view side, and the spa and private residences (to be built) are on the ocean side. Also the resort has a private lagoon within the property with tropical fish and corals and a marine biologist (Oliver) always on site for snorkeling and explanations of marine life of all sorts (snorkel equipment is already provided in your room). We stayed in an overwater bungalow, there are also beach villas that have two bedrooms or more. All of the bungalows look the same inside and out (apart from 2-3 bungalows at the very end of the pier that have a private pool), the only difference is the view that goes from resort to beach to lagoon to mountain view. We stayed in a mountain view overwater bungalow with a private deck that had lounge chairs, a table and outdoor shower, and steps that lead all the way into the water. The bungalow lights up underneath at night and you can see fish (also from the inside of the room as part of the floor is glass). The room consists of a living room with sofa and chairs, bedroom, bathroom area with separate shower, two sinks and huge (at least for 2) bath tub sided by a door that opens onto the deck for a breathtaking view. There are four restaurants in the resort plus special themed dinners by the beach (Polynesian dinner each Monday, etc.) .There is a French gourmet restaurant which is really good (maitre d’ and staff are French), a more casual dining place, which is also open for breakfast and lunch, the sunset bar, which is really cool and features Asian/sushi/fusion cuisine, and the pool bar. The staff are extremely attentive and caring. If you do not feel like walking you can always call the cart service and they'll take you anywhere within the resort. We walked most of the time as nothing is more than 5-10 minutes walk and it is so pleasant among the resort's vegetation (all carefully taken care of!). Breakfast is very abundant and delicious, even Nutella is available (guess what I had every morning!) and an amazing variety of tropical fruits and juices (the juice of the day is always an interesting combination of more than one flavor! ), plus croissants and other French pastries along with eggs, bacon etc. The concierge has a catalogue (2 inches high!) of activities you can book that range from jet ski tours, to all forms of snorkeling and diving for beginners and for those more advanced, in the barrier reef with their private boat or in a group etc. The hotel offers free trips to the main city on the island which is Vaitape (half hour boat ride). The city itself is not worth the trip apart from having a good look at black pearls, but beware of stores that sell them too cheap, and hand painted sarongs at the market. Everything else is very touristy unless you rent a bike and explore the surroundings. Black pearls: Amazing variety of qualities and colors (hues from purple to peacock to silver and blue) definitely more than you can find anywhere in Europe. The nicer qualities have the same prices you would find in Europe. The baroque or circled pearls have more affordable prices and would make a more fun souvenir of this amazing place! 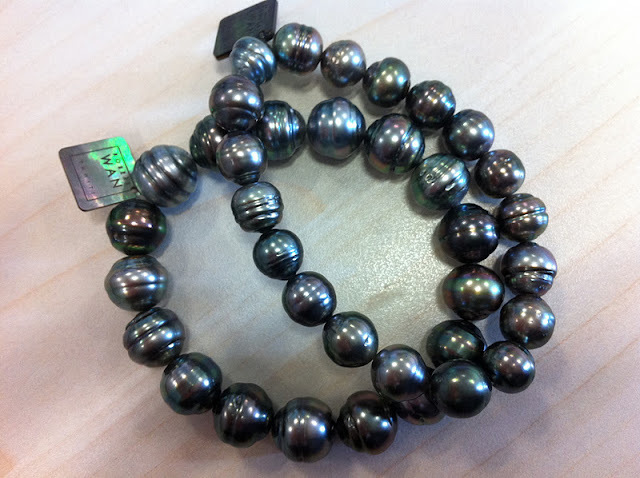 I bought mine at Robert Wan, he is the guru of black pearls. What else? Tropical fish, flowers and fruit everywhere, amazing sunsets, amazing colors in the water, and tiare, the island's most famous flower. After reading the post and watching the photos for more than 30 minutes I am aware of just one thing - I want to go there and the sooner- the better! The black pearl necklace is amazing. There's no other jewel that I like more!